An idea for a German restaurant advert dubbing tofu ‘gay meat’ has gone viral in the country after it was discovered on a branding competition website. 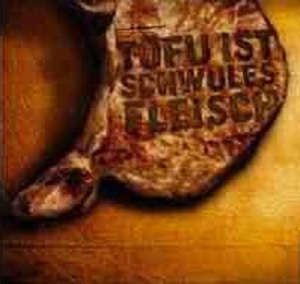 Scholz & Friends designed the ad, which shows a steak branded with the words ‘Tofu ist schwules fleisch’ for a restaurant chain, but it was never used in public, Der Spiegel reported. A spokesman for Scholz & Friends told Der Spiegel that the firm apologised for the steak advert, which has been hosted on the Art Directors Club website after the campaign won a prize in the competition it was designed for. Scooping a silver, the steak image was displayed on the ADC website along with other images from the campaign mock-up without complaint from 2009 until this week. Twitter users have been actively following the German advert, which efficiently manages to offend gays and soya bean fans in only four words, under the hashtag #tofuschwuchtel. The chain in question, Maredo, said the agency wanted to mock up adverts for their restaurant to use in a competition, and the restaurateurs had never seen the image.